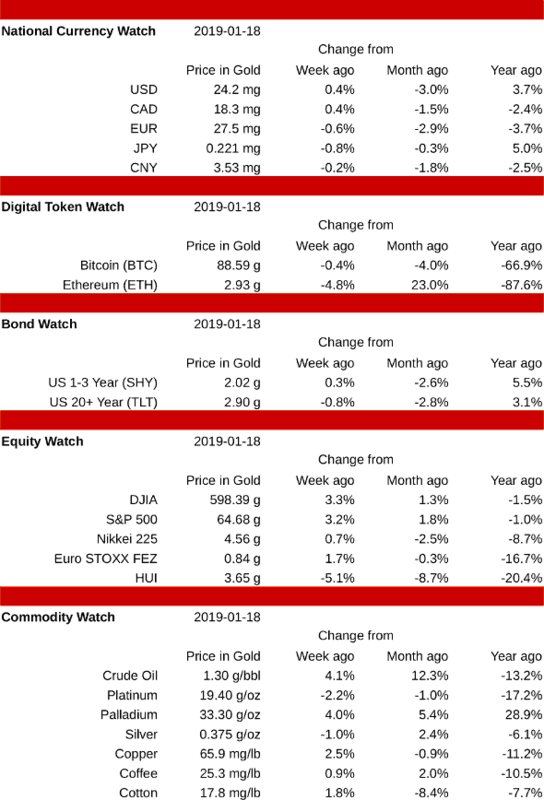 Cryptos were lower this week, while other asset classes were mixed. The biggest drops were in the gold stocks (off 5.1%) and Ethereum (down 4.8%). Crude oil, which rose 4.1%, and palladium, which gained 4.0%, were the week's biggest winners. North American currencies were higher, as the USD and CAD rose 0.4% each. The others tracked here were lower, led by the Japanese Yen, which closed down 0.8%. Not tracked here is the British Pound Sterling, which rose 1.0% for the week, possibly due to the sound defeat of PM Theresa May's Brexit "deal". Short term bonds rose 0.3%, while long term bonds fell 0.8%. Cryptocurrencies dipped sharply on Sunday, then recovered through the week. Ethereum finished the week down 4.8% while Bitcoin closed off 0.4%. Although gold stocks dropped 5.1%, the largest decline of any asset tracked here, all other equity indexes were higher. The Dow Jones Industrials and the S&P 500 led the field, rising 3.3% and 3.2% respectively. Crude oil (which rose 4.1%) and palladium (which gained 4.0%) were the week's strongest commodities (and strongest assets overall). Copper also showed strength, rising 2.5%. On the downside, platinum fell 2.2% while silver declined 1.0%.